Uathachas in Éirinn: Lá 'le Bhríde. Teacht an Earraigh, deireadh an Gheimhridh. Ach a mhalairt a cheapfá agus tuar na saineolaithe á léamh. Blianta fada ó shin bheadh Cros Bhríde crochtha i chuile teach in Éirinn. Fiú fiche bhliain ó shin bheadh siad le feiceáil sna scoileanna. N'fheadar an mbeidh siad acú amárach? Chuir an CLG tosach iontach le bhlian nua peile aréir in aineoinn an toradh agus bhí an ceiliúradh i ndiaidh an chluiche thar barr, cé gur deacair gan a thabhairt fá ndeara cé chomh minic is a chaill Na Dubs cluichí móra i rith buaicphointí 125 bhliain. Thaispeánadar cúl Jayo i 1995 sa chluiche leath cheannais i gcoinne Corcaigh, rud a bhain béic as an tslua. Béic níos airde fós a bhain cúl Shéamais Darby i 1982. Laoch gan sárú. Is maith an rud a chuimhniú go raibh maitheas éigin i muintir Uíbh Fháilí tráth dá raibh. Thógas giotaí bheaga de fís ar an nguthán ach ní fiú iad a léiriú. Seo iarracht eile ó YouTube. Ní léiríonn sé cé chomh iontach is a bhí sé áfach. 'Seans go mbeidh samplaí níos fearr ar fáil ar RTÉ.ie amach anseo. Bhí mé ag smaoineamh féin ar an Cros Bríde an deireadh seachtain seo chaite - agus na luachair ag fás fós sa ghairdín! Lá an-thábhachtach dom é Lá Féile Bríde ach tá brón orm nach bhfuil an scil nó an céird agam fós a d'fhoghlaim mé nuair a bhí mé ar scoil - níos mó ná fiche bliain ó shin. An chéad lá d'Earraigh agus bhí maidin glórmhar, grianmhar againn i lár na tíre. Fíor-tús an bliain nua, dar liom. Fáilte a Cháit! Mo chéad tráchtaire agus gan fiú cupán tae réidh agam duit. Gabh mo leithscéal. Is fíor duit caillteanas céirde i leith an Chrois úd. D'iarr mé air m'iníon an raibh trácht air an lá dár gcionn ar scoil. Ní raibh. Ní bhíonn in aon rud ach seal. Athrú chun donachta é.Bhí béim ar leith churtha ar an lá fad is a bhímse ag freastail ar an mbunscoil, ní amháin chun an naomh fhéin a cheiliuradh ach rudaí níos tábhachtach (dar liom ar aon nós) - tosach an Earraigh agus an tionscantachta atá ag baint leis an séisiúr. Agus sa dara háit, an meafar agus an sean- miotaseolaíocht atá chomhpháirteach le Bríd féin. Bhí plean agam féasta (beag!) 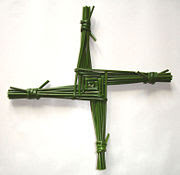 a eagrú le haghaidh an lá agus imbolc agus gach rud a bhaineann leis. Ach, nuair a mhol mé an plean, dúirt gach duine nach raibh an aimsir oiriúnach - beidh sé níos fearr ar an chéad lá de Bhealtaine. Níor thuig siad an rud ar bith. 'Sea. Tá sé deacair a mhaigh gurb é Lá 'le Bhríde túṡ an Earraigh nuair atá an tír ag titim as a chéile ar nós "The Day After Tomorrow"! Bhí na scoileanna dúnta aríṡ inniú anseo. Tá Bealtaine beo fóṡ sa bhaile seo againnse áfach. Lastar tinte ar fud na h-áite ar an lá úḋ, rud a chur ionadh orm nuair a bhogamar anseo roinnt bhlianta ó shin. Níor fhaca mé a leithéid riamh i mBaile Átha Cliath. Is ait an rud é mar, go bhfios domsa, is ceiliúradh iomlán Págánach an lá sin atá beo fóṡ, ach ṫá meath mór tagtha ar Féile 'Chríostúil' Bhríde. Is ait an mac an tsaol.